Last month I made a huge decision to buy a new quilting machine and frame. 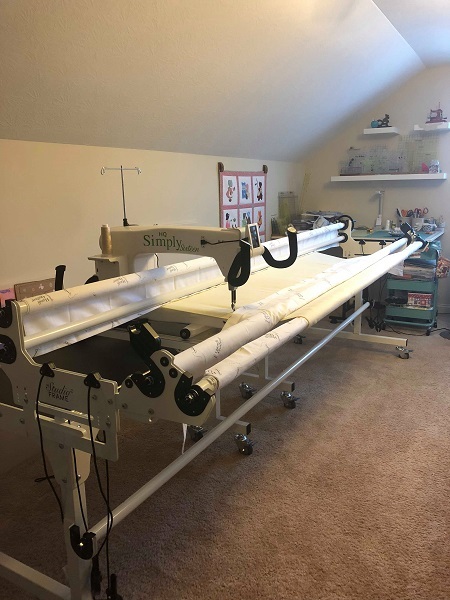 I had known for a long time that if I bought a longarm machine, that I wanted a Handi Quilter Simply 16 with a 10 foot frame. One of my concerns was the size and fitting it into my sewing room. My daughter told me to buy it and we would make it fit. She helped me carry everything that was stored under my old machine downstairs to make room for a new frame. Most of it was plastic drawers filled with fat quarters and other sewing notions. I was able to try out a used machine at our local quilt shop. This machine had all the extras with it and was very nice. I was so temped to buy it until I found a new machine at a shop online for almost the same price. I really wanted to support the local shop but I also had to think of my needs. I also discovered that the price was set by the previous owner of the machine and there was no room for negotiation. Used versus new, for the same price…. I went with the new. The machine and frame were delivered on a pallet and placed in my garage. My son-in-law carried all the boxes upstairs to my sewing room that evening. Bless his heart, they were so heavy! Now I needed to assemble the frame. My sweet daughter volunteered to put it together for me. But first, we needed to reconfigure my room. She is a planner and a perfectionist. She had planned the original layout of the room for me and now was rearranging the placement of my fabric cabinet, recliner, and cutting table. I was resistant to changing the location of these items but now I am in love with new arrangement. And the greatest part of it all….I have lots of room for the new frame and machine. This week Jennifer came over and we moved the furniture in my sewing room to get ready for the new frame. Her hubby was going out of town for the night on Friday, so she and the girls came to stay overnight. Jen and I (mostly Jen) worked upstairs, putting the frame together. On Friday she assembled the table and had half of the tracks finished before we went to bed. On Saturday we finished the frame and put the machine on it. Next was to add the front and rear handles and the accessories to the machine. We ordered pizza for dinner and then it was time to play with the machine. I loaded a baby panel for the top and a piece of flannel for backing. Then we played! This machine has a stitch regulator which I had to learn. My old machine only had a speed control and I had to regulate how fast to move the machine to obtain even stitches. It didn’t take long to get a feel for the new machine. I’M LOVIN’ IT!!!!!! 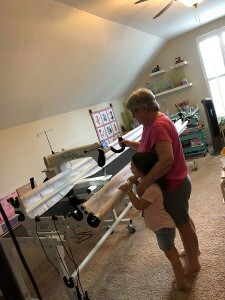 Sami and I checking it out before I loaded a practice quilt. She loves moving the machine on the tracks. 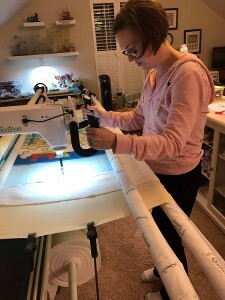 My future little quilter! Here is my daughter quilting for the first time. She had never quilted on a frame before this. She made feathers on the duck that look fantastic!